George Bollas played football at Warren G. Harding High School..
1946-47: George Bollas worked occassionally for Ohio promoter Al Haft as “The Mystery Man” for extra money at college..
1947: George Bollas turned pro and started working full time for Al Haft before moving to New York..
1948: George Bollas wrestled in New York as “The Greek Hercules” until geting banned from NY for ingniting a riot! 1948: George Bollas soon became known as “The Zebra Kid” because of stretch marks on his body from fluctuating weight..
~~~George Bollas was wrestling in Los Angeles when he thought of the Zebra Kid gimmick..
July 7, 1949 The Zebra Kid defeated Buddy Rogers for the Ohio version of the World Heavyweight title! November 8, 1951: Lou Thesz defeated The Zebra Kid to retain the National Wrestling Alliance World Heavyweight title in Toledo, Ohio..
November 1951: The Zebra Kid wrestled Whipper Billy Watson to a Curfew Draw in the Toronto territory..
1952: The Zebra Kid ventured to San Francisco, where he feuded extensively with Rikidozan..
September 1952: The Zebra Kid & Hans Schnabel defeated Gino Garibaldi & Leo Nomellini for the Pacific Coast Tag Team titles..
October 1954: The Zebra Kid returned and worked for Honolulu promoter Al Karasick..
April 10, 1955: The Zebra Kid defeated Lucky Simunovich for the NWA Hawaii Heavyweight title..
1955: The Zebra Kid defeated Rikidozan by DQ when Rikidozan went nuts and ripped Zebra Kid’s mask off! ~~~Rikidozan was “suspended” from NWA: Hawaii for his actions..
1956: The Zebra Kid wrestled in Georgia Championship Wrestling..
1957: The Zabra Kid returned to Columbus, Ohio and also had stints in Tennessee..
March 23, 1957: The Zebra Kid defeated Bob McCune for the Ohio State title in Columbus, Ohio..
July 13, 1957: After a match with Bearcat Wright, The Zebra Kid was attacked in the parking lot by a mob of fans..
February 1959: The Zebra Kid returned to the United States, and worked for Capitol Wrestling, feuding with Johnny Valentine.. The Zebra Kid moves to Texas for his next stint..
June 1960: The Zebra Kid defeated The Golden Giant for the Texas Brass Knucks title in Dallas.. 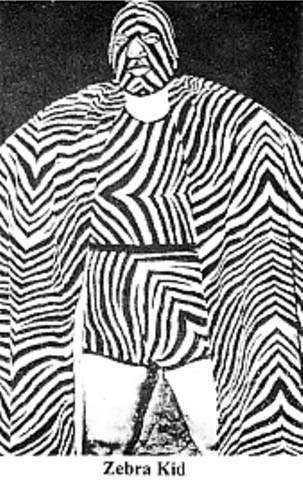 The Zebra Kid toured Europe, including England, Paris and Athens..
January 4, 1961: Mike Sharpe & The Zebra Kid defeated Nick Bockwinkel & Edouard Carpentier for the International TV Tag Team titles..
~~~Also in the AWA, The Zebra Kid & Hans Hermann defeated Pat O’Connor & Leo Nomellini..
June 1961: The Zebra Kid defeated Lou Thesz! in Long Beach, California.. The Zebra Kid travelled to Japan, where he would work for Rikidozan’s Japan Wrestling Association..
1962: The Zebra Kid once again returned to the Texas territory and eventually back to Ohio..
1964: George Bollas and his family settled in England with plans of getting into the promotional side of the business..
1965: George Bollas promoted matches in Greece with a cousin, and defeated George Gordienko before a crowd of 15,000 in Athens..
1968: The Zebra Kid retired and moved to Akron, Ohio after suffering a serious eye injury in Germany..
January 1977: George Bollas passes away at the age of 53..
September 1998: Angela Bollas & George Bollas Jr. were introduced on the field during halftime at an Ohio State University football game..
~~~George Bollas Sr. had been inducted into the OSU Athletic Hall of Fame..
Click here for a wonderful story of George Bollas’ life written by Will Morrisey and posted on Percival A. Friend’s Website..
2010: George Bollas’s grandson George Bollas Jr. began his wrestling career with a 4th place finish at the State of Ohio Junior High School Wrestling Championships. The tradition lives on!